Key difference: An asteroid is a large chunk of rock that orbits around the sun. Asteroids are also known as planetoids or minor planets. Comets, on the other hand, are icy bodies in the solar system that have wide orbits. When the comet passes close to the sun, the ice on the comet starts to melt. Hence, the debris embedded in the snow starts to fall off and trail behind the comet. This gives the comet a ‘tail’ like structure, called the coma. Both asteroids and comets are objects in space. 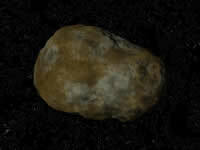 An asteroid is a large chunk of rock that orbits around the sun. Hence, asteroids are effectively part of our Solar system. Asteroids are also known as planetoids or minor planets. The term minor planet is actually preferred in scientific communities. There are effectively millions of asteroids. Most asteroids in our solar system are part of the asteroid belt located between the orbits of Mars and Jupiter. The asteroid belt consists of tens of thousands asteroids. They are generally rocks that have a high metallic content but no atmosphere. The size of an asteroid can range anywhere between a few meters wide and hundreds of km wide. They are smaller than planets but like planets some even have their own moons. Comets, on the other hand, are icy bodies in the solar system that have wide orbits. These orbits can take anywhere from a few years to hundreds of thousands of years to complete. The comets’ orbits are often directed by the gravitational pull of the other solar bodies, such as the planets, the sun and the asteroids. The comet is composed of loose collections of ice, dust, and small rocky particles. When the comet passes close to the sun, the ice on the comet starts to melt. Hence, the debris embedded in the snow starts to fall off and trail behind the comet. This gives the comet a ‘tail’ like structure, called the coma. The coma is thin, fuzzy, temporary atmosphere, which appears as a tail of the comet. The size of the comet can range from a few hundred meters to tens of kilometers across; the bigger the comet, the bigger its coma. As of January 2011, there were 4,185 known comets, the most famous of which is probably the Halley's Comet, which passes the earth every 75–76 years. There are two main types of comets: short-period comets and longer-period comets. The short-period comets are commonly believed to originate from the Kuiper belt and associated area, located just beyond the orbit of Neptune. The longer-period comets are believed to originate in the Oort cloud which is a spherical cloud of icy bodies in the outer Solar System. Like Halley's Comet, short-period comets have short orbits, while longer-period comets take more time to come around. Recent research into the formation and the makeup of asteroids and comets has shown that they are quite similar in content. The main difference being the fact comets are practically asteroids with ice on them. In fact, some asteroids are believed to have once had ice on them. Hence, it is said that when the comet has ejected all of its water and other vaporized materials over various completions of its orbit, it will eventually become an asteroid.